Welcome to “An Evening In Vienna” 2016! You will register as lead or follow through Paypal on our Registration page. If you provide your email address, we will confirm your reservations. Reservations will be limited to 300; tickets are not available at the door. Increases to $95 after March 30th. A limited number of Reserved Tables will be available. The cost of the Reserved Table is in addition to the cost of the personal reservations. This is an excellent way to insure that there is a place for you and your group to meet. All tables not reserved will be open seating and shared by all participants. only from Dance for Joy! Or by mail — Make your check payable to Dance for Joy!, PO Box 16060, Seattle WA 98116. Please include the names of your party, and whether they are leads or follows, along with your email address so that we may confirm your reservation. If you do not have an email address, please provide your phone number if you wish to receive confirmation of receipt of payment. 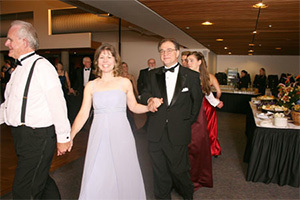 Both couples and singles enjoy participating in the Ball and as is the case at similar events across the country, many dancers enjoy the pleasure of dancing with a variety of partners over the course of the evening. If you would like to join us for An Evening In Vienna festivities, but feel your dance skills need a bit of polishing? There will be a 3-hour Last Minute, Last Chance Ball Prep workshop on June 23rd, 6:30-9:30 pm, the Thursday evening before the Ball. Location to be announced. Register by email and pay at the door. “Black tie” refers to the gentleman’s clothing, more specifically a tuxedo with white shirt and black bow tie. “White Tie Optional” refers to the more dressy form with a white bow tie. Both are distinctly elegant. Vests or cummerbunds are often worn as well. Gloves are a nice touch, but optional. Men may rent tuxes for a modest fee and many tux shops carry a variety of price options for purchasing tuxes. Ladies typically opt for ball gowns — that is, floor length dresses. Many women around the United States enjoy wearing full-skirted ball gowns as they sway and float beautifully with the movement of the waltz. All colors are seen whirling on the dance floor. Gloves are a nice touch, but optional. Those that enjoy a flair to the more dramatic may choose vintage attire from the Regency period to the 1920’s Ragtime Era. For moderately priced gowns, eBay and Goodwill are good resources. I have been successful with both in finding cost-conscious choices. I have also been very successful at a consignment store in Kirkland called Champagne Taste, 147 Park Lane (425) 828-4502. 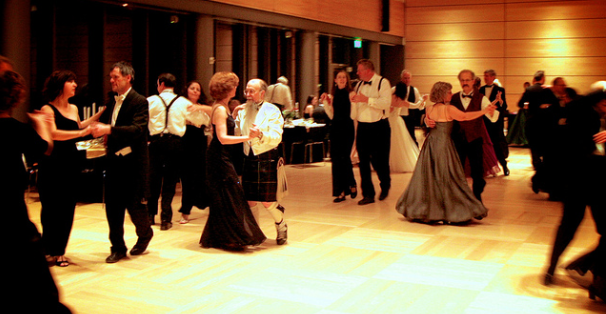 There will be lots of Waltz of all tempos, Swing and Foxtrot, Polka, Tango and Cha Cha. When you arrive, there will be DJ'd music for mingling and dancing. The Grand March will commence the first Orchestra Set at approximately 6:45pm. What is a Grand March? What is a Fledermaus Quadrille? 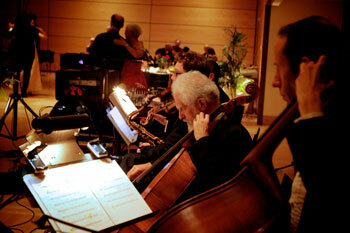 There will be performances on the second orchestra break and DJ'd music for dancing. As you arrive, a light buffet of various fruits, cheeses, breads, spreads and meats will be available. 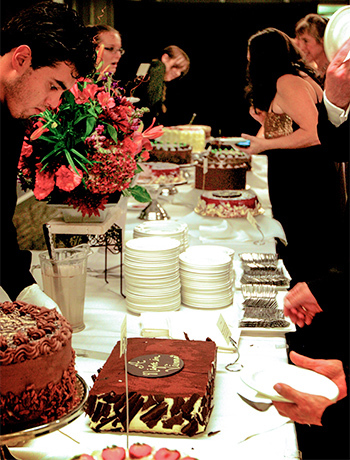 Later in the evening, a Grand Dessert Buffet will be presented with elaborate torts by Dilettante Chocolate and vegan torts by Whole Foods. Non-alcoholic beverages and water will be available throughout the evening. Parking is available on the University of Washington Campus. The Padelford Garage is the closest parking not designated handicapped. You can find the location of the HUB Ballroom and Padelford Garage on this map of the UW campus. A coat check operated by the University of Washington Swing Kids will be available for your personal items. The Swing Kids promote dance on the University Campus and are a non-profit organization. A donation box will be available for your support of their efforts — we suggest $2/coat. 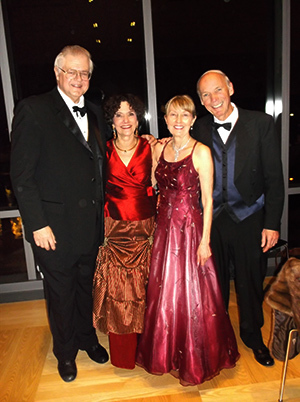 at our “An Evening In Vienna” Waltz Ball 2016.
or make your reservations by mail as noted above.